I’ve finished my first-ever game, just in time for the end of NaGaDeMo 2012. 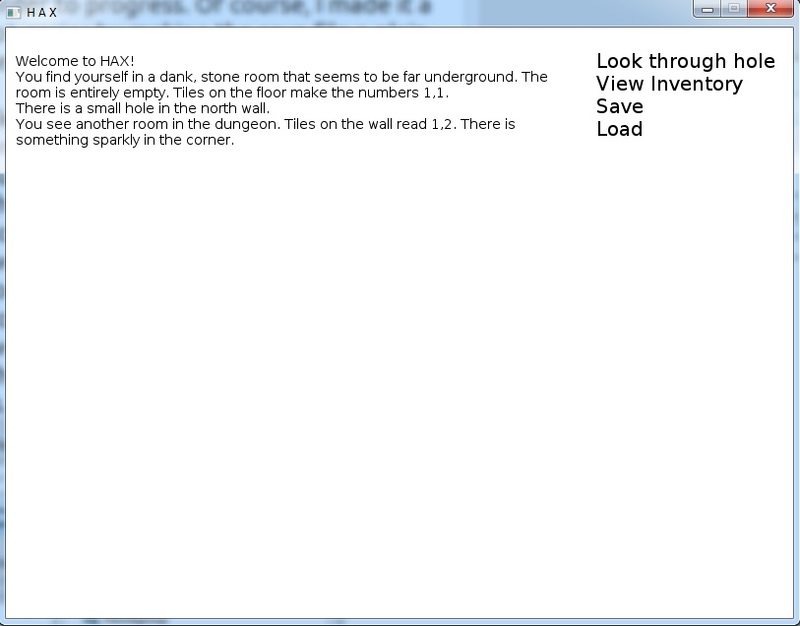 It’s called HAX, and it’s a text adventure where the only way to win is to cheat. You can download it from the NaGaDeMo site here. The zip contains standalone distributions for Windows and Mac OS X, as well as the .love file if you’d rather install LOVE 0.8.0 instead (this is the only way to play it on Linux right now). I had a lot of fun making this game. I’d never programmed in lua before, so that was exciting. I’m pretty happy that I managed to finish this tiny thing in a month, with how hectic my life is right now. Please play it, and let me know what you think! And also feel free to post here if you have any trouble running it or run into any bugs. ETA: Seems like there are some issues with the NaGaDeMo games submission right now. For the time being, you can download HAX from Dropbox. ETA2: It’s available on the NaGaDemo site now! ETA3: I made a Hint System for the game using Twine, since one puzzle in particular didn’t have enough roadsigns for the solution. So if you get stuck, feel free to get a hint!